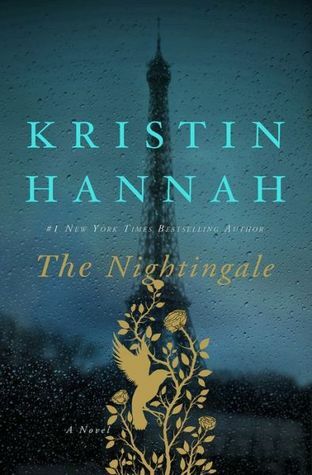 I’ve heard so many good things about Kristin Hannah’s The Nightingale that I bumped it to the top of my reading list despite feeling a bit burned out on WWII books. I’m glad I listened to the recommendations. The Nightingale is set in France, partly in Paris but mostly in a small, rural village called Carriveau. It follows two very different sisters, Vianne Mauriac (married name) and Isabelle Rossignol. The two are well-acquainted with the horrors of war—or at least with its aftermath. Their father fought in WWI, and was never the same afterward. Shortly after the war, their mother died and their father, who’d started drinking, essentially abandoned them. Vianne, the eldest, was in no way prepared to take care of her significantly younger sister. Vianne could scarcely take care of herself. In short order, she fell in love, got pregnant, got married, and miscarried. Fortunately for Vianne, the man she married, Antoine, was a rock. They had a solid, loving, mutually supportive marriage, although the supporting was mainly done by Antoine. Isabelle stayed with them on and off, but she was a difficult child. When Vianne lost another baby, she was too grief-stricken to deal with Isabelle and sent her away. Isabelle experienced a lot of being sent away during her youth. She was constantly being expelled from the boarding schools her father sent her to. And when she tried to go to her father in Paris, he couldn’t be bothered. She grew up fiercely independent, yet needy. War breaks out. Antoine is sent to the front lines. Vianne is left to cope. She and Antoine now have a young daughter, Sophie, and Vianne realizes she has to be strong for their child. Isabelle is sent away from Paris as it becomes too dangerous and she comes to the little town to join them. During the evacuation of Paris, she meets and falls in love with Gaetan, a young man determined to fight the Germans from within France. But he, too, abandons her to pursue his dangerous goals. Things really fall apart when the Germans invade Carriveau. A German officer moves in to Vianne’s home. She is ready to do anything to protect Sophie. Isabelle is much more rebellious and willing to risk all to resist the Germans. So, the women fight the war on the home front, each in her own way. This is a touching story of the relationship between sisters, a love tested in every conceivable manner. And it’s a story of a horrific war. The atrocities committed by the Nazis always make reading about WWII depressing and infuriating. People did inhuman things to other people–and it’s painful to read. And yet, it’s uplifting to read about those who resist. The novel starts off a bit slow, setting the stage for what’s to come. I felt it got a bit repetitive as it reinforced the reasons for the estrangement between the sisters and their personality traits and why they behaved as they did. However, once we get into the meat of the story, the pace really picks up and the conflicts become increasingly emotionally involving. Overall, it’s a wonderful book, deserving of the hype. The Determined Heart. The Tale of Mary Shelley and Her Frankenstein by Antoinette May is a touching story of the devoted love of Mary Godwin Shelley for the romantic poet Percy Bysshe Shelley. 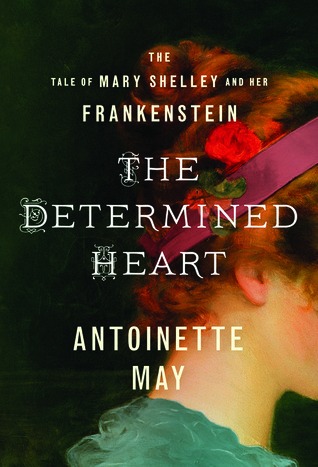 It recounts details of the unconventional lives they lived and follows Mary’s struggles with her own literary pursuits, including her most famous work, Frankenstein. Mary was the daughter of the famous Mary Wollstonecraft, a philosopher and women’s rights advocate and William Godwin, a political philosopher. Her mother died from complications of a difficult childbirth. Mary and a stepsister, Fanny, were raised by William Godwin. When Mary was four, her father remarried, bringing another stepsister, Claire, into the household, along with a stepmother who was so glaringly different from her brilliant mother that Mary could not help but rebel. Part of William Godwin’s credo (supported by Mary’s mother) had always been advocacy of free love and the rejection of the chains of marriage. So the fact that Shelley was married should have been no obstacle to his pursuit of Godwin’s daughter. Imagine Shelley’s surprise when Godwin refused to let the pair run off together. Mary is warned that a man who abandons his wife and children so readily is not likely to be faithful to her, but she can’t believe that. Their love is different. Shelley arranges to run away in secret. Mary must choose between her father and her lover, and she chooses Shelley. Imagine Mary’s surprise when Claire appears at the meeting place and Shelley, without any apparent hesitation, invites the interloper along. Mary makes the best of a situation that isn’t exactly what she imagined. She and her poet do have a life filled with passion, love, and intellectual engagement. She meets other men and women with similar interests (for example, Lord Byron.) They travel. She and Shelley both write. There are babies and miscarriages. She has to put up with his infidelities. She has to put up with Claire. And yet, her love for him runs so deep, she forgives everything, always, and takes refuge in her writing. The Determined Heart is an absorbing novel. I was familiar with the historical basis of the story from having read Passion by Jude Morgan—a tremendous novel that looks at the lives of the women involved with Shelley, Byron, and Keats. The Determined Heart has a more narrow focus, allowing it to provide more biographical information about Mary—a protagonist well deserving of the attention. For a more sweeping look at the historical times and an examination of several passionate, literary women, I also recommend reading Passion. 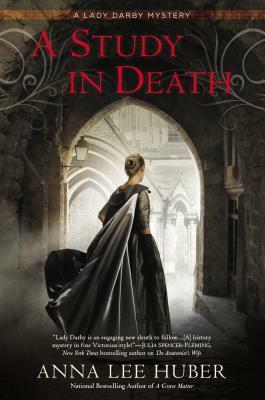 I’m a devoted follower of the "A Lady Darby Mystery" series by Anna Lee Huber, so I dove in to the newest offering: A Study in Death. The series is set in Scotland in the early 1800's. Lady Kiera Darby is a young widow. Her late husband, Sir Anthony, was at one time a respected anatomist. However he became embroiled in scandals which included the revelation that he forced his wife (a talented portraitist) to illustrate the dissections he conducted. That he beat her and terrorized her meant nothing to fashionable society—they ostracized her for her part in the ghoulish business. After his death, Kiera retreated to the safety of her sister’s home where she found some protection in the sheltering arms of her sister and brother-in-law. But her peace did not last. A murder was committed on their property and Kiera, too well acquainted with death, was drawn into the murder investigation, as both suspect and investigator. During the course of the investigation she met the official ‘gentleman investigator’, Sebastian Gage. By the time they solved the murder, a relationship had blossomed between them. The next books continue to develop Kiera’s investigating skills as well as her comfort with the fact that this is something she is not only good at but compelled to do. The relationship between the sleuths also continues to develop. In the current book, Kiera is occupied with her first talent, portrait painting. She has been commissioned to paint a young lady of her social set, Lady Drummond, whose kindness and friendliness have drawn Kiera in. More, Kiera is drawn to her by the recognition that Lady Drummond’s husband is a bully just as Sir Anthony had been, and Lady Drummond is terrified of him. Kiera feels Lady Drummond is about to open up to her and wonders if she can encourage her without prying. Then Lady Drummond dies, quite horribly, and Kiera is certain she has been murdered. Kiera and Gage investigate, though Gage is not, at first, sure that a murder has occurred. Complications include the impending birth of Kiera’s nephew (or niece.) Her sister has a history of difficult deliveries and this one may be life-threatening. Her brother-in-law is acting oddly, straining the usually tight-knit household. And, there is the problem of Gage’s father arriving in the city, determined to break up the partnership between Gage and this very unsuitable female. Finally, there is the criminal mastermind/head hoodlum that Kiera crossed in the previous book who owes her a favor and now lurks in the background, both threatening violence and protecting her from it. As in previous books, there is a thoughtful, deliberate collection of clues, sifting of evidence, and an element of danger that keeps things moving swiftly. But it is the personalities of the characters, Kiera’s psychological journey and Gage’s steady support along with some growth on his part as well, that make these books particularly enjoyable. I look forward to the next book in the series!